I saw Christmas decorations in the supermarket today. Admittedly, they were tucked behind ranks of lurid Halloween costumes – but still. Between these and the inexplicable (and surely eternally unused) nets-of-nuts, family pack chocolates and tubs of cheesy footballs already banked at end-of-aisles, I think we can say it: consumer Christmas has begun. It means it’s only a matter of time before we start to experience peak clickbait contradiction. “Why a sober Christmas is the only choice for responsible parents” vies with “Don’t tell the kids! 5 Christmas cocktails you can disguise as hot chocolate”. Truly, Christmas wouldn’t be Christmas without consumer frenzy scarcely tempered by a litany of ‘opinion’ pieces telling us that drinking too much is going to make our livers fall out. Christmas is painted as all excess – extremes of indulgence and self-denial lock horns. It’s a time when, traditionally – apparently – work slows down and we clear our mental decks for the new year. Curious then, isn’t it, that this mental purge is shadowed by extremes of indulgence? Because if there’s one thing you can pretty much guarantee – at some point this December you’ll wake up with a hangover. 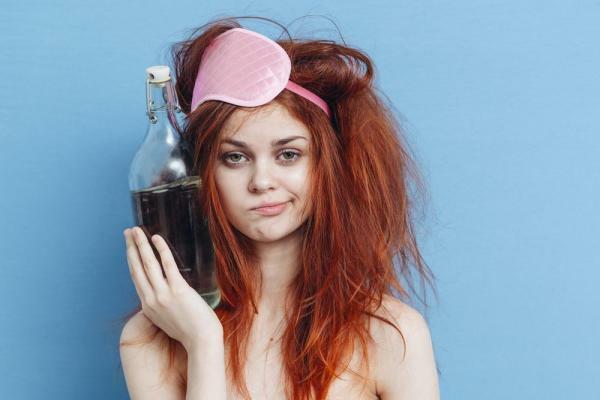 This year, rather than deploring your sore head, why not flip the wisdom of a thousand articles sharing “10 failsafe ways to beat that hangover” on their heads. Why not embrace it? It’s an oft-quoted wisdom that creativity and dysfunction go hand in hand. The symbiosis between mind-alternating substances and creative expression is long chronicled. Be it the absinthe-addled inhabitants of 19th-century Paris; Dionysian Aeschylus; bar-brawling Marlowe or erudite Amis, frequenter of London waterholes – the image of the inspired drunk is firmly entrenched. But what of hangovers? Are they merely penance for creative release? Arguably, if alcohol disinhibits, then a hangover allows us to connect with our emotional, instinctual selves. Most of the time that instinct is to make a triple-decker sandwich. But sometimes, a hangover allows us to approach creative tasks with a peculiar sort of focus. Just as we tolerate the long established association between drunkenness and creativity, maybe it’s time to embrace hangovers too as an unplugged source of creative inspiration. Tell that to your boss the morning after the Christmas party. Previous post: Do winemakers improve with age?